(Nanowerk News) In the quest to make hydrogen as a clean alternative fuel source, researchers have been stymied about how to create usable hydrogen that is clean and sustainable without relying on an intensive, high-energy process that outweighs the benefits of not using petroleum to power vehicles. 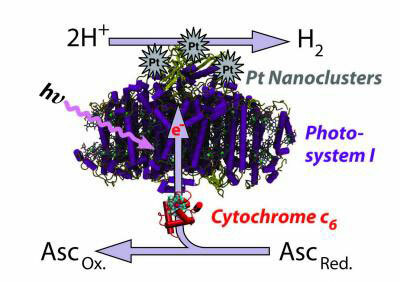 New findings from a team of researchers from the University of Tennessee, Knoxville, and Oak Ridge National Laboratory, however, show that photosynthesis – the process by which plants regenerate using energy from the sun – may function as that clean, sustainable source of hydrogen. The findings are outlined in this week's issue of the journal Nature Nanotechnology. Bruce, who serves as the associate director for UT Knoxville's Sustainable Energy and Education Research Center, notes that we already get most of our energy from photosynthesis, albeit indirectly. The fossil fuels of today were once, millions of years ago, energy-rich plant matter whose growth also was supported by the sun via the process of photosynthesis. There have been efforts to shorten this process, namely through the creation of biomass fuels that harvest plants and covert their hydrocarbons into ethanol or biodiesel. "Biofuel as many people think of it now -- harvesting plants and converting their woody material into sugars which get distilled into combustible liquids -- probably cannot replace gasoline as a major source of fuel," said Bruce. "We found that our process is more direct and has the potential to create a much larger quantity of fuel using much less energy, which has a wide range of benefits." A major benefit of Bruce's method is that it cuts out two key middlemen in the process of using plants' solar conversion abilities. The first middle man is the time required for a plant to capture solar energy, grow and reproduce, then die and eventually become fossil fuel. The second middle man is energy, in this case the substantial amount of energy required to cultivate, harvest and process plant material into biofuel. Bypassing these two options and directly using the plant or algae's built-in solar system to create clean fuel can be a major step forward. Other scientists have studied the possibility of using photosynthesis as a hydrogen source, but have not yet found a way to make the reaction occur efficiently at the high temperatures that would exist in a large system designed to harness sunlight. Bruce and his colleagues found that by starting with a thermophilic blue-green algae, which favors warmer temperatures, they could sustain the reaction at temperatures as high as 55 degrees C, or 131 degrees F. That is roughly the temperature in arid deserts with high solar irradiation, where the process would be most productive. They also found the process was more than 10 times more efficient as the temperature increased. "As both a dean and a chemist, I am very impressed with this recent work by Professor Bruce and his colleagues," said Bruce Bursten, dean of UT Knoxville's College of Arts and Sciences. "Hydrogen has the potential to be the cleanest fuel alternative to petroleum, with no greenhouse gas production, and we need new innovations that allow for hydrogen to be readily produced from non-hydrocarbon sources. Professor Bruce and his team have provided a superb example of how excellence in basic research can contribute significantly to technological and societal advances."